Abhilash V. Durgam, MD, cares for patients ages 12 and older living in Beasley, Bellaire, Galena Park, Houston, Missouri City, Needville, Orchard, Richmond and Rosenberg. He specializes in fibroid treatment (uterina myoma), minimally invasive surgery, robotic surgery (robot-assisted surgery), hysteroscopic myomectomy, infertility and menopause. 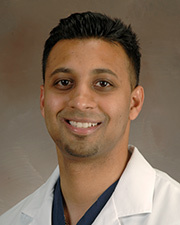 Dr. Durgam’s patients appreciate his compassionate nature and the time he spends with them. His priority is to ensure that each individual understands the problem, diagnosis, treatment and/or preventative measures that can be taken. When he is not providing patient care, Dr. Durgam enjoys basketball, winter sports, reading or participating in outdoor activities in the Sugar Land area where he resides with his wife and two sons.